With Albertans heading to advance polls, Rachel Notley says a huge swell of supporters show that more is at stake in this election than ever before. People from all walks of life are coming together behind her campaign to create jobs, build pipelines and diversify the economy while defending the things that matter to families. Notley was joined by Calgary entrepreneur Usman Tahir Jutt, who didn't vote NDP in 2015, but is supporting the plan to expand affordable $25-a-day child care across Alberta. 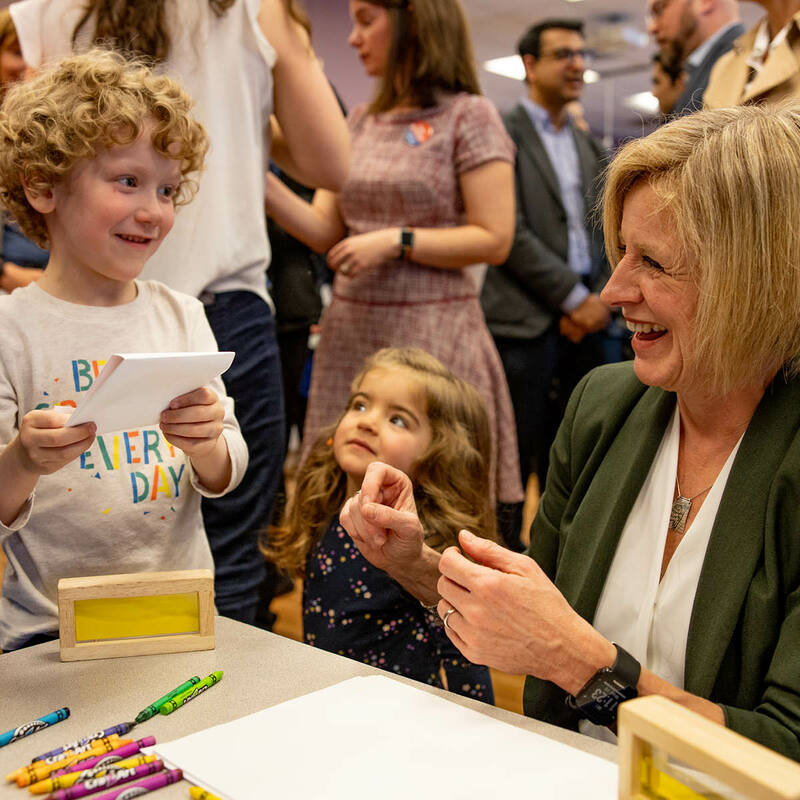 Jutt talked about how he's seen the benefits of Alberta's $25-a-day child care pilot up close, wanting to see it rolled out throughout the province. “At my restaurants, I have had the privilege to recruit so many amazing young women into leadership roles," Jutt said. "But as they begin to have families, they face a difficult choice." Having an affordable child care options allows employees to not have to choose between raising families and growing businesses like Jutt's. Estimates show that $25-a-day child care across Alberta would increase employment by 43,000 people and add nearly $6 billion a year to our Gross Domestic Product. Economists tout the benefits of affordable child care as increasing earning potential, better use of public investment in training and education, and as a tool to attract a talented workforce. The Conference Board of Canada has said that every dollar invested in child care generates a $2 return. Over the next five years, Notley’s plan will invest $1.5 billion to ensure families across Alberta pay $25 per day. The plan would also address wait times by adding 13,000 new spaces to the existing 62,000 spaces in the province. Faced with a dramatic choice in her opponent, Notley continued making an impassioned pitch to Albertans of all political stripes. It's a message she has repeated since the first day of the campaign. As Kenney's ties to extreme fringes have been revealed, and as more observers have declared his economic plan needlessly risky, the message is beginning to sink in. Kenney's combatative style is also risking the energy sector he talks about protecting. Kenney will hand big corporations a no-strings tax cut, will add tolls, cut overtime pay. And when it comes to pipelines, Kenney's plan is to stomp his feet, throw a tantrum and jeopardize the Alberta economy for the sake of political theatre. Notley touted her plan for the biggest Made-in-Alberta upgrading plan, investment in health care and education, promising that the Trans Mountain pipeline would be approved by the end of May. Notley also made her pitch to supporters of the Alberta Party or the Alberta Liberals, arguing that Kenney represents too great a risk to the future prosperity.